4.56 points at 25 votes (rank 799). A rather simple computer game, in which you have to try to slowly land a spaceship on Jupiter. For this you have three landing platforms. If you make it to land on one of the three platforms with slow falling speed in the yellow range (meter display at the right of the screen), you get points and a refill of the tank. The game is over when the tank display shows zero. The space ship is destroyed when landing with too high speed or when touching the rock walls of the planet. This game is a simple simulation of a spaceship landing, whereby the crash onto the planet by gravity is slowed down by starting rockets and the thus created repulsion of the engines. The design is a bit inspired by the game "Lunar Lander". Simple sound effects accompany the game. At the start you can hear a short melody. A Fire left maneuvering thruster, move spacecraft right. D Fire right maneuvering thruster, move spacecraft left. F1 Fire main thruster, lift spacecraft. Beginners should train on the 5x platform until they master the manoeuvring and landing of the spaceship. Later you should always use the 10x platform, if you have more than 60% fuel. For a perfect landing on the 10x platform you can grab 7.000 points and enough fuel for further landings. If the fuel display shows only approx. 30%, only the 2x platform can be approached. In the animation you can see a "perfect" landing on the 10x platform. The version by "Remember" offers next to the different trainers (unlimited fuel, collision query off) also the manual. Rockford: "The screenshot could be placed in wikipedia below 'monotony'. Nothing, not even the slightest thing changes, except for maybe the gravity, but even with that I am not sure. I haven't even used the three offered platforms, only the first one (5x). 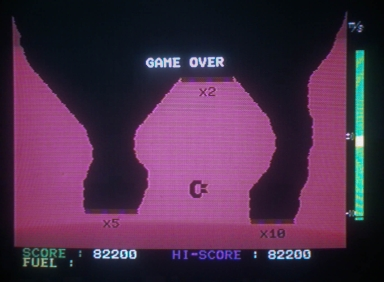 If it wasn't for the incentive of a highscore here, I surely would have deleted the game after 2-3 landings." 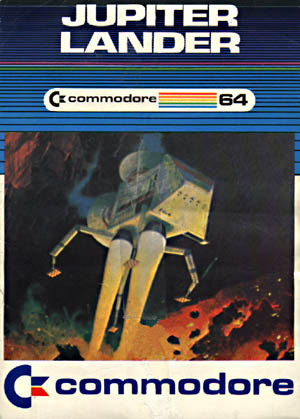 Worf: "If you look at the game within a series of games that deal with the topic spaceship needs to land on the moon or planet with limited fuel, then it must be definitely viewed as the top game of this genre on the C64. The simplest shape is merely text-based, each round you only get instructions about how much thrust you must give, as an answer the program gives the new height, speed and the fuel that is left. To give this school game of the first computers some graphics is already a progress. Further new elements are the approach towards the landing platform and the manoeuvring through a gorge. The monotonous graphics that is criticised here so intensively is rather good compared to previous games as e.g. "Mondlandung"." TheRyk: "For sure no must know. Taking the age of the game into consideration, it is okay and was somewhat entertaining at its time." 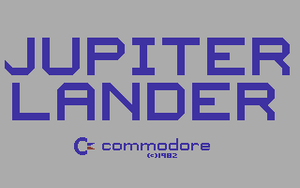 Robotron2084: "If anyone does not like JUPITER LANDER, then he has to be hit on the head with a hammer! 5 out of 10 points! *ouch! *"
Shakermaker303: "Oh dear, the game is really miserable. The title might sound good and alluring, but it is in my opinion a waste of time. A small + because it is from 1982. But there are already better and more complex games stemming from this year. Ah, and I also quite like the title screen :-). Therefore I can only give 3 pity points." blubarju: "The game is quite okay. For a small round in between it is still fun. 4 points." 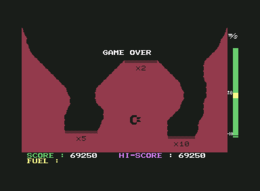 Lunar Lander in the Killer List Of Videogames. This page was last modified on 18 November 2018, at 01:09.